Today I am going to share where I get my cross stitch patterns from. I may not be the most experienced stitcher, but I am pretty darn experienced at shopping. It is my pleasure to be your personal cross stitch pattern shopper for the day. Just what you've always dreamed of, I know! If you have been reading this blog for a while, you know I love a good craft book. I have way too many, but only 4 cross stitch books. I like more modern, minimal designs and I find it hard to find fresh cross stitch books that I love. I have all of the books shown above, and I love all of them. I have made a deer and a cameo from A Rainbow of Stitches, and my Liberty flowers came from Liberty Cross Stitch. I'd love to dig into the other two books, but I haven't yet had the time. There are SO many patterns in these books and so little time! I only buy one cross stitch magazine - Cross Stitcher. It is a UK based publication, and I pay dearly for it at my local Barnes & Noble (about $12 an issue). I know, I know. But to me it is so worth it. I make a "me time" treat out of sneaking off to the bookstore alone, scooping up the newest issue, browsing all the books I'll never buy because I am spending $12 on a magazine, and maybe even splurge on Starbucks. I love the fresh, modern patterns, the features on new products, and the colorful photography and staging. I love it all. 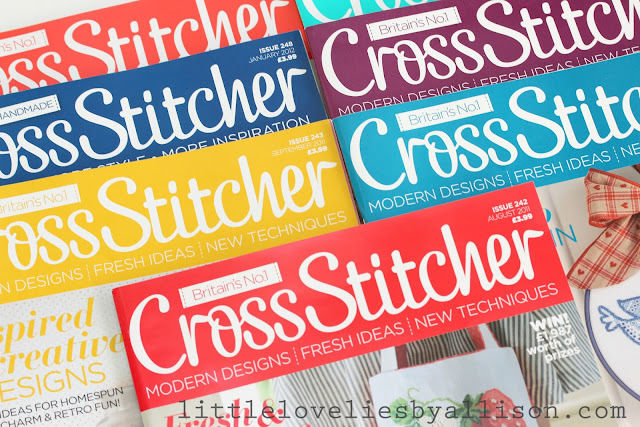 There are so many other cross stitch magazines available as well - check out your bookstore to see what they have. Another great pattern source is Etsy. The above shops are some of my favorites for modern, fun, and unique cross stitch patterns. While writing this post, I found about 20 patterns that I want to buy - they are all just so good! Click on the pictures to take you directly to the shop. Who doesn't love free? There are lots of free patterns floating around out there if you do a bit of searching. I searched Pinterest and found these. I really love that strawberry makeup bag. The colors are perfect and summery. If you like these patterns and want to Pin them, click on the link above and go to the source. You could also give the blogger/pattern maker a thank-you in the comments while you are there. That'd be nice. Is that enough pattern inspiration for you? I could keep going and going. I just love books and patterns. If there is one thing I am good at it's collecting far more ideas than I could ever carry out. Let's just say I am an idea hoarder just like to surround myself with inspiration. *These links are Amazon Associate links. Click here for more disclosure info. I just discovered Cross Stitcher magazine last week. I love that if you buy it at the store, you get free stuff with it. The one I bought had everything you need to stitch a Royal Guard and a needle book. I just finished the Royal Guard. There's also a iPad and iPhone app for the magazine! I posted a picture of the Guard on my blog. Does anyone know where to get the chart for this one? I've checked all through the magazine and can't find it anywhere. :( I really really want to stitch this little guy up, but my eyesight is far too poor to use the envelope that it came in as a pattern. I love Cross Stitcher! I get so excited when I find a new issue! I love Cross Stitcher magazine - I use to borrow my mums copy before I moved to the USA and was so so pleased I can still get it over here. I always buy it from JoAnns because they often have 10% off magazines so it ends up being a little cheaper. Worth the money though! Feliz Páscoa para toda a família! I only buy Cross Stitcher too. And it isnt much cheaper here (UK) than it is in the states! But the fantastic patterns are sooooo worth it. I also get their sister magazine Molly Makes. Another gem! You can also get Cross Stitcher much cheaper via Zinio for the digital version. I have it on my tablet and I have no problem with following patterns etc. Hi Allison - thanks so much for the great write-up about the mag - we love making it so it's good to hear that it's also a treat to read! Love your blog - so inspiring. I've got one of my own but haven't updated it since I joined the CrossStitcher team - I'm just so busy making lovely stitchy stuff!